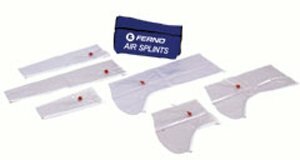 Air Splint KitFerno Air Splint KitFerno Air Splint Kit include a hand/wrist, half-arm, full-arm, foot/ankle, half leg and fullleg splint. Splints are also available individually. Features: • Simultaneously splint and stop superficial bleeding• Inflates with simple lung pressure• X-ray translucent• Can be used on children by resizing half-leg or fullleg splints• Zippers allow quick application• Kit includes one each of the following splints: hand/wrist, half-arm, full-arm, foot/ankle, half leg and fullleg.• Splints also available individually• Comes complete with a nylon carry case Product photo may not exactly match the product offered for sale. Please refer to the product description.